Turn a tzatziki recipe into delicious pita sandwiches. 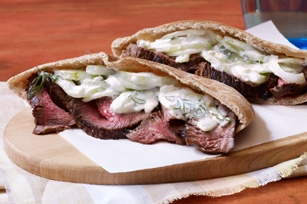 Grilled Steak with Tzatziki Salad is one of our favorite steak and tzatziki recipes. Marinate steak as directed. Heat broiler. Place steak on rack of broiler pan sprayed with cooking spray. Broil, 4 inches from heat, 8 to 10 min. on each side or until medium doneness (160ºF). Cooking the meat at a higher temperature than recommended will overcook or char the meat, poultry or fish before the interior reaches desired doneness. Check the owner's manual for specific grilling information. Prepare using BREAKSTONE'S Reduced Fat or KNUDSEN Light Sour Cream, and ATHENOS Crumbled Reduced Fat Feta Cheese.